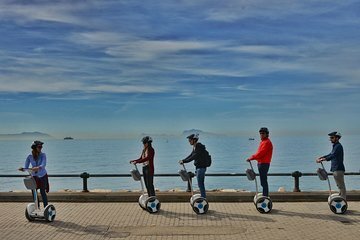 Esplora la storia e l'architettura di Napoli in questo tour guidato in Segway. Vieni in una comoda posizione centrale e fai una rapida sessione di allenamento prima di indossare un casco e saltare su un Segway Ninebot. Ascolta un tour audio narrato mentre navighi verso monumenti come Spaccanapoli Street, il Maschio Angioino Castle e Plebiscito Square. I confess having witnessed the chaos that is driving around Naples, I was a little apprehensive about taking to the streets on a Segway. I needn't have been. Our guide I'm embarrassed I cannot recall her name was excellent and made it a highlight of our stay in Naples. The tour is a generous 3 hours and included a sample of a local pastry Naples 3 P's Pasta, Pizza and Pastries - none great for your waistline plus some free time to wander in a couple of the locations visited. We had done a Segway tour before but don't be put off if you haven't, training is provided and its no harder than riding a bike. A great way to see the sights, then come back later for a more in depth look at those that most interested. I completely recommend this tour !